As you prepare for Thanksgiving, Tails On Trails wants to share how you can make it a fun and safe holiday for your pets too! Before you start cooking, you'll want to make sure your home is ready for guests and how it may affect your pets. ID Tags, Microchips and Potential Escape Artists! If your dog is microchipped, make sure the chip is active and your contact information is correct. You can bring them to your vet to scan the chip to make sure it hasn't shifted over the years and is still functional. Make sure your pets always have a collar with an ID tag on them, as they can easily slip out when guests are exiting and entering your home. Take a recent, clear photo of your pet to keep handy in case they do get out. You can also make a free lost pet flyer in case they do go missing. If you have a dog that's a "runner," consider keeping them crated, leashed up to furniture, or secured in a locked room when people are coming or going to prevent an escape! Coats, purses and shopping bags are dangerous to pets often because of what's inside. Many people keep their gum (including sugar-free xylitol gums and nicotine replacement gums), medications, cigarettes, and other items (some legal, some not) in their coat pockets or bags. A pet could easily ingest something from a guest’s bag or coat. Unfortunately, it's a very common occurrence with animal poison control and in veterinary emergency rooms. Hang all coats and bags safely in a closet or on a coat rack to avoid a pet emergency. It will not just prevent your pets from getting poisoned, but it will also prevent your pets from soiling or otherwise destroying your guests' possessions. Anything in your overnight guest's suitcases and toiletry bags can be dangerous to your pet, including clothing, grooming products and medications. An easy way to keep your pets safe from the things your guests bring into your home is to request that all visitors keep bedroom and bathroom doors closed, and that they keep all bags up off the floor. Easy! A house full of noise, new faces and small children may be too stressful for your dog. Consider creating a safe space for them. Use either a well-padded crate or place them in another secure room. This will help them feel less overwhelmed by all the activity. Consider picking up a new toy for your dog or cat to help keep them entertained while you're hosting your two-legged guests! If your pet has triggers or fears, let your guests know. It's better to educate everyone staying in your home when they first arrive, so they know your dog and their needs. No one wants to make it harder for you or your pets, so give them the information they need to create the best holiday experience possible! Now that your home is secure, your pet's information is up to date and you have a plan for guests, it's time to talk turkey! While sharing is caring, not everything on your Thanksgiving Day plate is pet-friendly! Don't give your dog turkey bones. They pose a serious risk for choking. Don't give your dog holiday food. Stuffing may have onions and oils they can't digest. Pies, cakes and cookies are all made with sugar and other ingredients that could be toxic, such as chocolate. Don't share your celebration toasts. Wine, beer, champagne - all liquor is toxic to pets. Do keep an eye out in the kitchen and at your table. 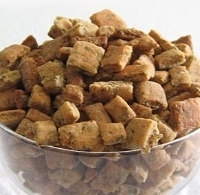 Food placed too low or close to an edge is a tempting treat for any dog. Do keep burning candles out of the way of wagging tails. Keep them high up on tables or mantels! Do set aside a special plate for your pet. It's safe to give them plain, cooked turkey breast as long as there's no skin! Brussel sprouts - in moderation, they cause gas! 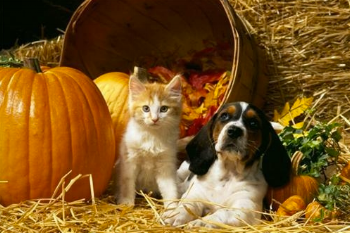 We love the idea of making something pet-friendly just for our furry friends each holiday. Here are some of our favorite recipes you can easily make at home. 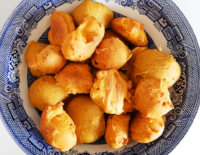 Click the title of each recipe for the link to the detailed instructions. 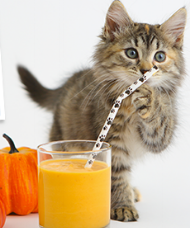 Pumpkin Smoothies - Cat and Dog Friendly! from the Tails On Trails family to yours! Posted on November 22, 2016 by Jocelyn Hawkes.